For the last few months, I’ve been quietly running a small pop-up on this site used to help build a mailing list for those who are interested in wanting to get better at WordPress development. I know, I know: This kind of stuff seriously annoys a certain breed of people, doesn’t it? Myself included! But at the recommendation of a friend, I tried it. And it’s been working. The mailing list has been successfully growing over the last few months, and I’m getting ready to start something new at the beginning of 2016. To that end, I wanted to share a little more about what’s in store for the first quarter of next year. 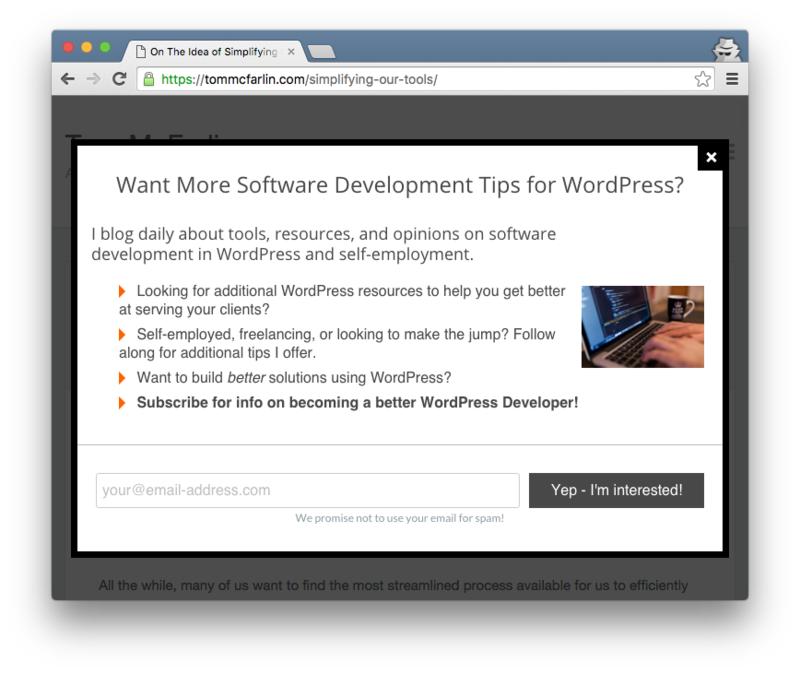 As the dialog describes, the purpose of this is to help those who want to be more involved with WordPress development and possibly go self-employed. To that end, I’m planning to include a variety of articles, tools, and resources to help with doing that. This will be the first premium-level content I’ve ever offered on this site. At this time, and it’s subject to slight change, the high-level outline for the content is as follows. Each month, I’m going to be providing four articles that walk you through a variety of solutions needed in order to put together a development environment, staging environment, and a production environment and the significance of each. I’ll also be recommending a variety of sites and newsletters worth your subscriptions to help stay up-to-date with all things WordPress-related (some news, some development). If you’re considering starting a freelance career or even just starting up a side business, this month will focus on things I’ve found useful in my own career. At this point, I’ve worked for my own company longer than I have for any other company. Furthermore, I’ve been able to provide for a growing family all the while being deeply involved with the WordPress community. This month will focus on ideas and strategies you should have in place before you make the jump from where you are now to where you want to be. Now is an exciting time to be part of WordPress. There are some fantastic new tools in the pipeline and some very exciting solutions can be built with the core software. The challenge? You have think creatively and approach your solutions with the right frame of mind. WordPress excels in both content management and blogging, but it can do so much more than that. And in this month, I’m going to cover exactly that. Specifically, I’ll talk about how to broaden your thinking about WordPress as an application foundation, how to think about using it when building web applications, and what the future of the core application holds for us as developers. I believe not everyone is as invested in WordPress as others. To that end, I want this content to be exclusive to a specific group of people – those who want to get better at setting up their workflows, those who want to learn how to stay up-to-date with all that’s going on with WordPress, and those who want to expand their frame of thinking about WordPress. Those who want to get better are proactive about improving themselves. Articles can be valuable and the conversation that ensues in comments can help us talk more about anything than I could ever write as a single person, but there are plenty of other incredibly intelligent people involved in WordPress. To that end, this content will also include monthly podcasts with a variety of guests all of whom are notable in WordPress and who have been successful in their particular niche of the industry. If any of this sounds like it’s what you’re looking for, then please stay-tuned to this blog and/or be sure to sign up for the mailing list when you get a chance and I’ll be sure to contact you when it’s time to register. Note I’m limiting space to this particular series of articles, podcasts, and conversation to make sure we’re able to keep conversation as manageable as possible. If all goes well, it will definitely be made available again in the future. Oh yeah – I guess it would help to cover that, right? I mean, with the holidays coming up and the new year on the horizon, it’s worth planning to build this into your budget, right? $69 for access to the articles. $89 for access to the articles and the discussion forum. $99 for access to the articles, the discussion forums, and the podcasts. $119 for articles, discussions, podcasts, and an export of the data for review when the quarter is over. The page for purchase is not yet setup, but I’ll be sure to let everyone who has registered for the mailing list know exactly when it’s ready. If, for whatever reason, you have trouble signing in, signing up, or not being able to register for the mailing list, no worries. Just shoot me an email. As far as email addresses are concerned, I’m only using them so I can give you a heads up when I’m accepting registration. I’m not going to spam you about any random projects nor am I going to sell it or share it with anyone else (mainly because that’s lame and the total opposite for how I want to be :). With that said, I’m looking to start this in January so I’ll have more to say about this in a future post. Anyway, I’m excited and I look forward to hanging out with all of you in the coming months. Comments are closed on this post. Email me if you have any questions.